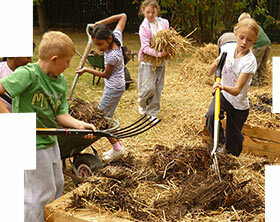 There is a wealth of information for school gardeners available on the internet. The BBC's Dig In campaign, Garden Organic, Growing Schools and the RHS Campaign for School Gardening have excellent information on growing healthy vegetables, from making beds and preparing the soil to pest control and water conservation. Find out what gardeners in other parts of the world are growing and how they are already coping with the impact of climate change. I am part of the rose family and native to Central Asia. I am the world’s most important salad plant. I come from the Andes Mountains and was first cultivated about 7,000 years ago. I originated in South and Central Asia dating back to 3500 BC. Scientists are unsure whether I originated in Central Asia, Ethiopia or the Mediterranean. My wild ancestors are fond throughout Asia and Europe. I am a delicious fruit, native to Eastern Asia, with wide culinary and medicinal uses. I originated in Persia (modern day Iran) and spread to China around 600AD. My small wild ancestors are found in temperate areas all over the Old World. I am native to the Central Americas and was first domesticated in Mexico, by at least 2600 BC. I am native to the Americas and was cultivated by the Aztecs as early as 700 AD.